Florida’s recreational and commercial stone crab claw harvest season opens Oct. 15 in state and federal waters. To ensure this valuable resource is available for generations to come, take care when removing crab claws, and follow all protective management guidelines for stone crab harvest. 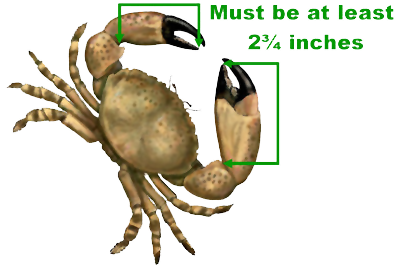 To be harvested, stone crab claws must be at least 2¾ inches in length when measured from the elbow to the tip of the lower immovable portion of the claw (see illustration). View a video on how to properly remove the claw, and increase the likelihood of survival of the released crab. Recreational harvesters can use up to five stone crab traps per person. Stone crabs may not be harvested with any device that can puncture, crush or injure a crab’s body. Examples of devices that can cause this kind of damage include spears and hooks. Recreational and commercial traps may be baited and placed in the water 10 days prior to the opening of the season but may not be pulled from the water for harvest purposes until Oct. 15. Traps that are not being fished should be removed from the water to avoid ghost fishing, a process in which marine species get caught in the trap for extended periods of time and are not harvested. 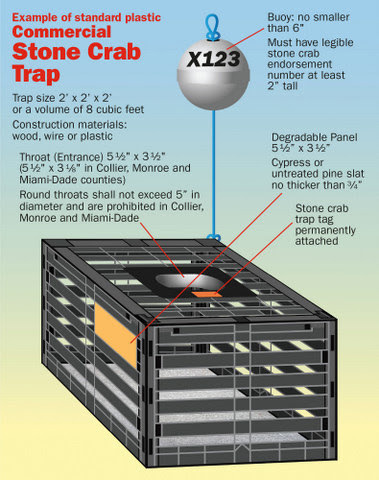 Stone crab trap specifications recently changed in Collier, Monroe and Miami-Dade counties.Effective as of Oct. 5, the use of round entrances (also known as throats or funnels) will no longer be allowed for stone crab traps used in state or federal waters off Collier, Monroe and Miami-Dade counties. The changes will also require that the rectangular or rounded rectangular entrances typically used in stone crab traps be no larger than 5½ by 3 1/8 inches at the most narrow portion of the opening. Stone crab traps being used in other areas of the state may have an entrance that is 5 ½ by 3 ½ inches. The season will be open through May 15, 2016, closing May 16.